LoA is a two-person board game which is played on a checkers board. Is a connection game like Hex or Twixt, but in contrast to the typical connection games, LoA is more chess-like because pieces are moved over the board instead of put on the board, and pieces can be captured. LoA was invented by Claude Soucie in the early 1960s, and was popularized by Sid Sackson in the first edition of his book “A Gamut of Games”, (1969). The game was recommended by the “Spiel des Jahres” in 1988. (German for Game of the Year), an award for board and card games, created in 1978 with the stated purpose of rewarding excellence in game design, and promoting top-quality games in the German market. LoA is one of the games of the annual tournaments “Mind Sports Olympiad”, where run many World Championships of mental disciplines, and “Computer Olympiad”, a multi-games event in which computer programs compete against each other.The rules of the game. The rules are really easy to learn. Within minutes you'll be playing effortlessly, even as a first time player of the game. 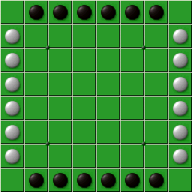 The black pieces are placed in two rows along the top and bottom of the board, while the white pieces are placed in two files at the left and right side of the board. Players alternate moves, with black having the first move. 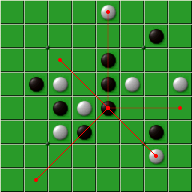 A player to move must move one of its pieces. A move takes place in a straight line (along files, ranks, or diagonals), exactly as many squares as there are pieces of either colour anywhere along the line of movement. (These are the Lines of Action). A player may jump over its own pieces, but not land on them. A player may not jump over the opponent's pieces, but can capture them by landing on them. The goal of a player is to form one connected group with all of its pieces. The first player to do so is the winner. Connected pieces are on squares that are adjacent, vertically, horizontally or diagonally. 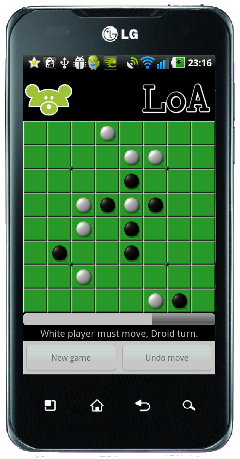 If one player is reduced by captures to a single piece, this player wins the game, because his pieces are by definition connected. If a player cannot move, this player has to pass. (Is a disputable rule, because some players think that the player loses). 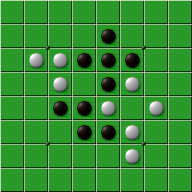 If a position with the same player to move occurs for the third time, the game is drawn. Currently, the unique LoA game for Android!